COMMENTS: Good detail in the design. Makes a nice bar of soap. COMMENTS: I bought this to make soaps for my Dad for Christmas. He loved them! I love the size and ease of detailing when using. COMMENTS: This is a good mold and easy to hold. COMMENTS: We have several horses and I am glad I found this mold,it makes great bath bombs and soaps. COMMENTS: True to mold, wish it was silicone. 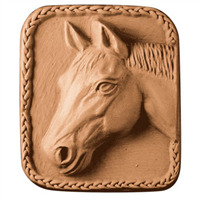 COMMENTS: I am going to use this mold for my horse friends and buyers. It's very pretty! Easy to get the soap out cause it is not too thick. COMMENTS: This is a gorgeous horse mold! Makes very beautiful soaps. COMMENTS: I plan to do multi colored soaps with this. This is also great for horse lovers. I haven't used this mold yet but am a fan of Milky Way molds. COMMENTS: Nice size over 4 oz and horse cavity is big enough to play with colors, beautiful. COMMENTS: Though not quite as easy to use as a silicone mold, this is so cute I had to have it for all my "horsey" friends as gifts.